Dimensions: length – 6.5″ / 165mm; weight – 0.6oz / 17g. Polished head gives a fine touch. Perfect for outdoor cooking and camping. 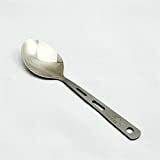 High quality titanium spoon. Elegant design with matte finish handle. Lightweight and easy to carry. Dimensions: length – 6.5″ / 165mm; weight – 0.6oz / 17g. A great product for outdoor cooking, poykes, BBQs and camping. Product of Toaks.